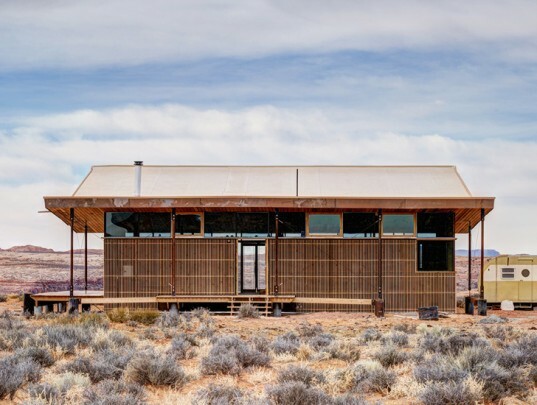 The Skow Residence is a beautiful straw bale home set beneath a large sun-shading roof in the Utah desert. Harold and Helena Skow were working on a traditional kit home, but they were unable to finish it - so they called on students in the Design Build Bluff program to help. The students were inspired by Harold Skow's large sun-shading sombrero, so they decided to invert the kit's pre-made trusses and create a large roof to shade the new straw bale home. Harold and Helena Skow had a traditional Navajo “home build kit” and had already completed a CMU foundation for the traditional rectangular gable-trussed home. The Skows had not finished the house though when Design Build Bluff and students from the Colorado Building Workshop came along. As the students were first touring the site and meeting with clients, they noted Harold wore a large sun hat. When asked about it, Harold commented that, “Everyone should have a sombrero in the desert.” Inspired, the students decided to build the home its own sombrero for shading. Since a lot of materials were already on hand and a foundation was already completed, the students began their design with this in mind. The Skow Residence was constructed on the original foundation and all the trusses were utilized – but turned upside down. The 800 sq ft home is separated into 2 volumes with private bedrooms to the north and public living spaces to the south. Straw bale walls and natural earthen plaster surround the bedrooms to provide thermal mass and protection from the elements. On the south, the living spaces enjoy views of the desert, solar heating in the winter months and shade in the summer. An east entrance and porch provides a shaded zone for outdoor living in the afternoons. The Skow Residence's Sun-Shading Roof Was Inspired by a Sombrero! 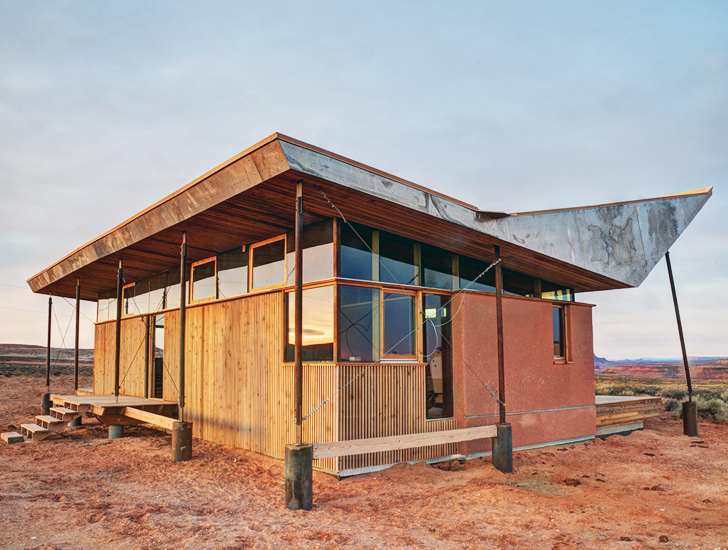 Harold and Helena Skow had a traditional Navajo “home build kit” and had already completed a CMU foundation for the traditional rectangular gable-trussed home. The Skows had not finished the house though when Design Build Bluff and the students from the Colorado Building Workshop came along. As the students were first touring the site and meeting with clients, they noted Harold wore a large sun hat. When asked about it, Harold commented that, "Everyone should have a sombrero in the desert." Using that as inspiration the students decided to build the home its on sombrero for shading. The 800 sq ft home is separated into 2 volumes with the private bedrooms on the north and the public living spaces on the south. 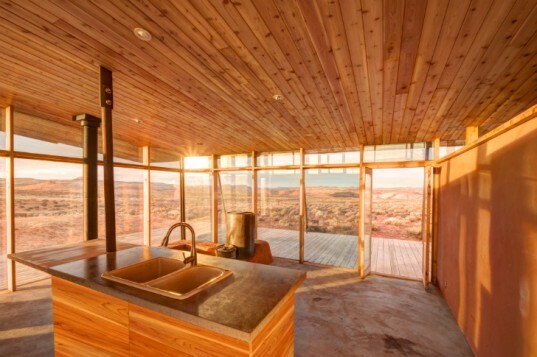 On the south, the living spaces enjoy views of the desert, solar heating in the winter months and shade in the summer. Straw bale walls and natural earthen plaster surround the bedrooms to provide thermal mass and protection from the elements. Since a lot of materials were already on hand and a foundation already completed, the students began their design with this in mind. Trusses in use but upside down for the roof. The Skow Residence was constructed on the original foundation and all the trusses were utilized, but turned upside down. A traditional kit home on the Navajo Nation in the 4 Corners region.